Living in New York has allowed me to become a peripheral part of the crew of fans who spend nearly every day at a game. They can be found in the top rows of Section 420B in Yankee Stadium or 514 in CitiField and I usually join them for the final few innings if I happen to be at a game. On Monday, while enjoying seeing the Yankees getting smacked around by the Mariners, I sat behind Mike "King" Casiano, who is so nicknamed as he is the most prolific ballpark visitor, having now seen over 7,500 baseball games live. He rarely misses a chance to add to his total, and will try to see afternoon minor league games in the New York area when possible. He mentioned that he would be driving to Lakewood, NJ on Wednesday to see the BlueClaws, Philadelphia's affiliate in the South Atlantic League. 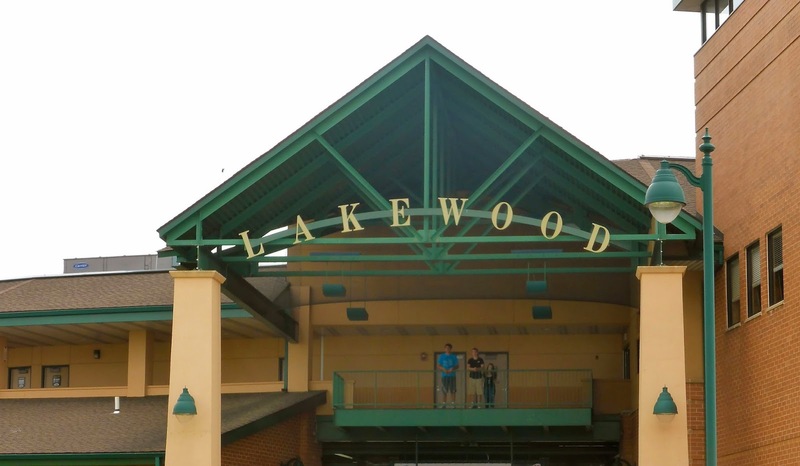 Lakewood is one of the minor league ballparks I had yet to visit, so with nothing else to do, I decided to join him. Mike had rented a car for the week as he would be making several trips over the next few days with both the Yankees and Mets out of town on the weekend. We had to get going early with the start time at 11:05, so Mike picked me up at 8:15 and we made the 75-mile in about 2½ hours, arriving about a half-hour before first pitch. 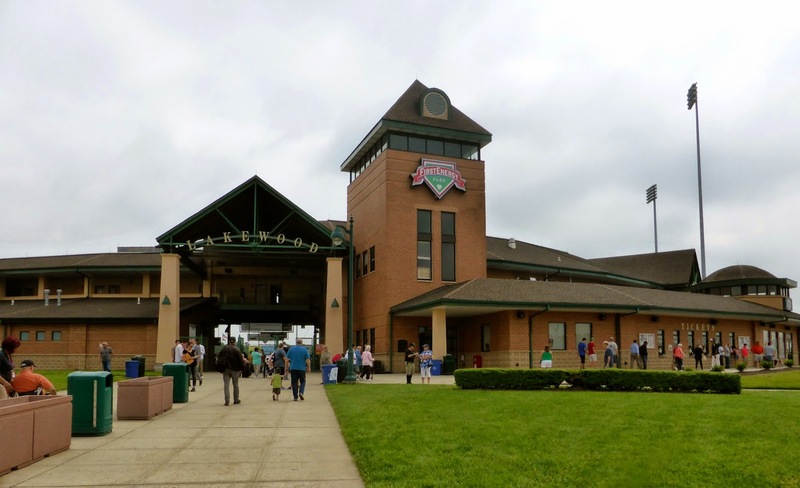 We received some good news upon reaching the box office: it would be a doubleheader as there had been a rainout on Tuesday. 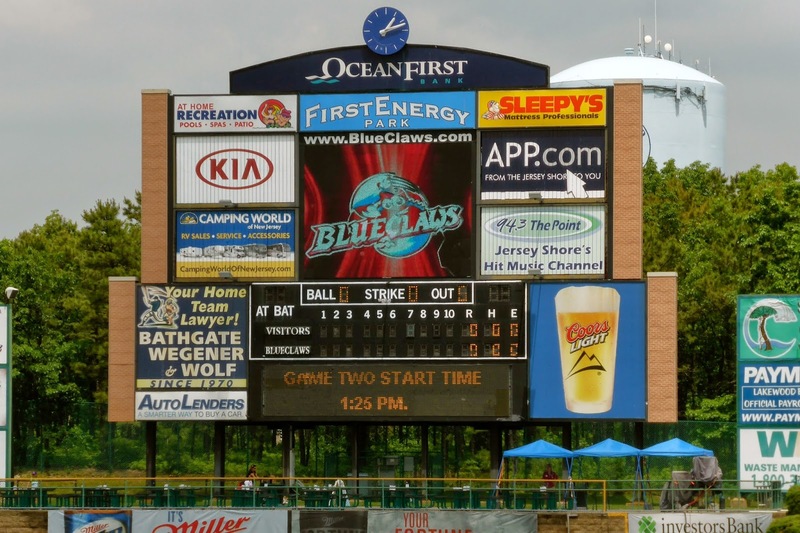 The BlueClaws, named for a type of crab that populates the Jersey Shore, play at FirstEnergy Park, just a couple of minutes off the Garden State Parkway. Parking is $3 and tickets on game day are $10 for general admission. Fortunately, we found a gentleman with some extras, and got in for a bit less. The tickets were in the first row behind the plate, so I sat there for the first game, talking with our benefactor, who is 82 years old and has 61 grandkids (including great grandkids). He provided some interesting commentary during the game as well. In between games, I took my traditional lap around. Being an early start, there were few fans so many of the concession stands were closed. 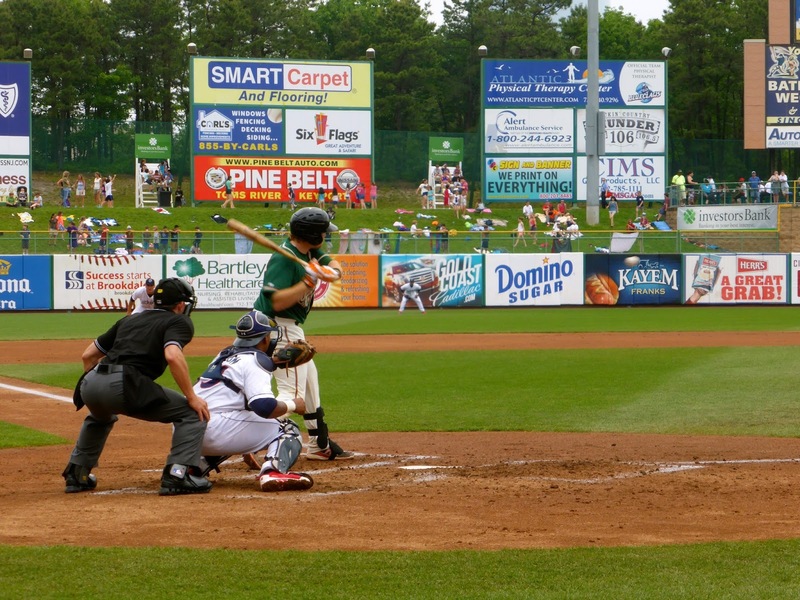 The park is typical for a lower-level minor league facility, with a single seating bowl that extends down the lines, and lawn seating behind the fences. The unique element is the collection of gigantic beach chairs that sit behind the concourse in the outfield. Although the view from here is not the best, it looks like a fun place to get some rays (below). This is the view from centerfield. A very nice ballpark as you can tell. The scoreboard is also quite good for this level of baseball, with a small video board atop the linescore. Note that Game 2 was scheduled to start at 1:25. Morning minor league doubleheaders are a great invention. 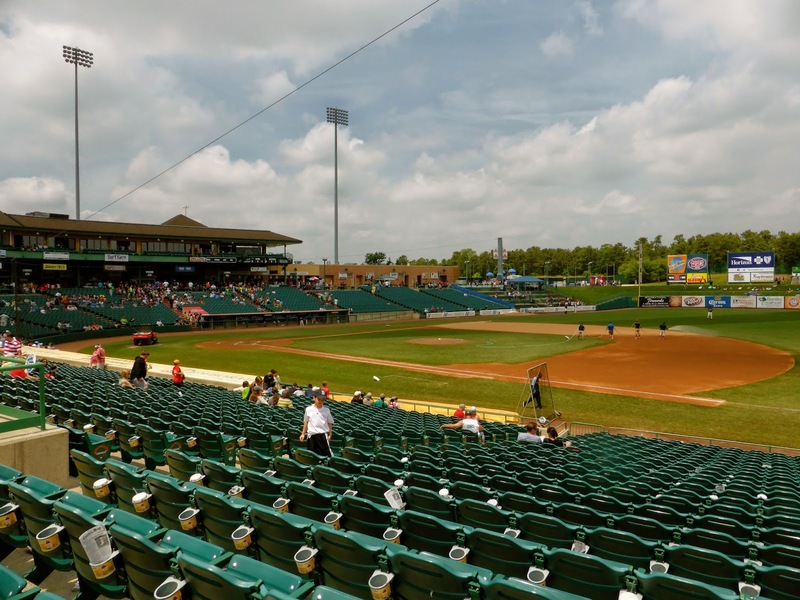 The Greensboro Grasshoppers, affiliate of the Marlins, were the visitors. Their most recognizable name might be catcher Chad Wallach (batting below), son of former Expo Tim, who was drafted in the 5th round in 2013. The first game moved quickly as starters Ryan Newell (7th round, 2012) of Greensboro and Ranfi Casimiro matched zeros for the first five frames. In the top of the sixth, Casimiro was replaced by Cody Forsythe (25th, 2013) who gave up back-to-back singles to J.T. Riddle (13th, 2013) and Carlos Lopez (10th, 2013) that left runners on the corners. Felix Munoz rolled one to second, too slowly for for a double play, and Riddle scored to give the Grasshoppers the 1-0 lead. 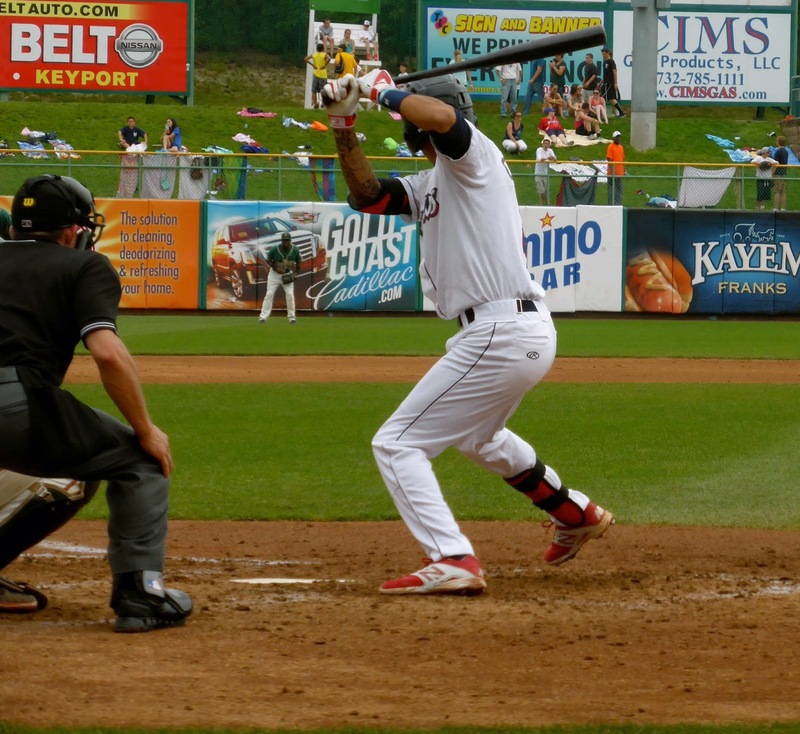 In the bottom of the inning, J.P. Crawford (below, Philly's 1st-round pick and 16th overall in 2013) singled but he was the last baserunner for the BlueClaws as Newell retired the final six batters he faced for his first career complete game and shutout. Yeah, it was only seven innings, but it still counts. Newell threw only 77 pitches in a very efficient outing. He should know this sort of pitching will not get him to the majors, where you have to throw 100 pitches over five innings so managers can overmanage by making plenty of time-consuming pitching changes, thus extending the game much longer than it needs to be. 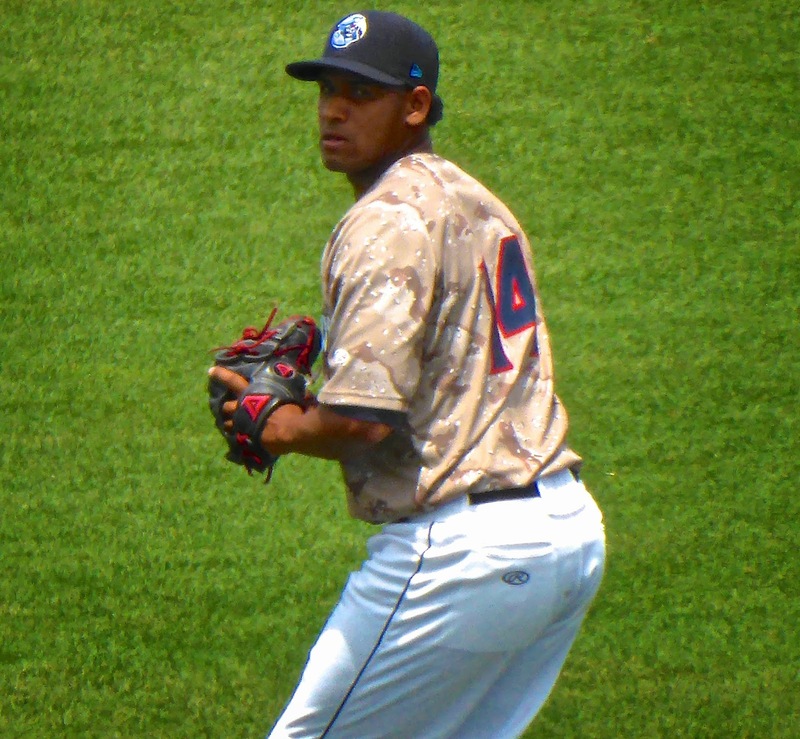 Lakewood switched to their camouflage uniforms for game 2, as sported by starter Julio Reyes (above). The game was similar: fast paced and low scoring. The BlueClaws scored a run in the 2nd off Sean Townsley (25th, 2013) and then added an unearned run in the 6th off reliever Sean Donatello (25th, 2011). That was all Reyes, who threw five scoreless frames, and fellow Dominican Ulises Joaquin needed as Lakewood earned the split with a 2-0 win. This was my 200th ballpark lifetime. As well, I have seen 80 of the 160 active minor league venues, and am now thinking of completing the remainder of those during the 2015 summer. 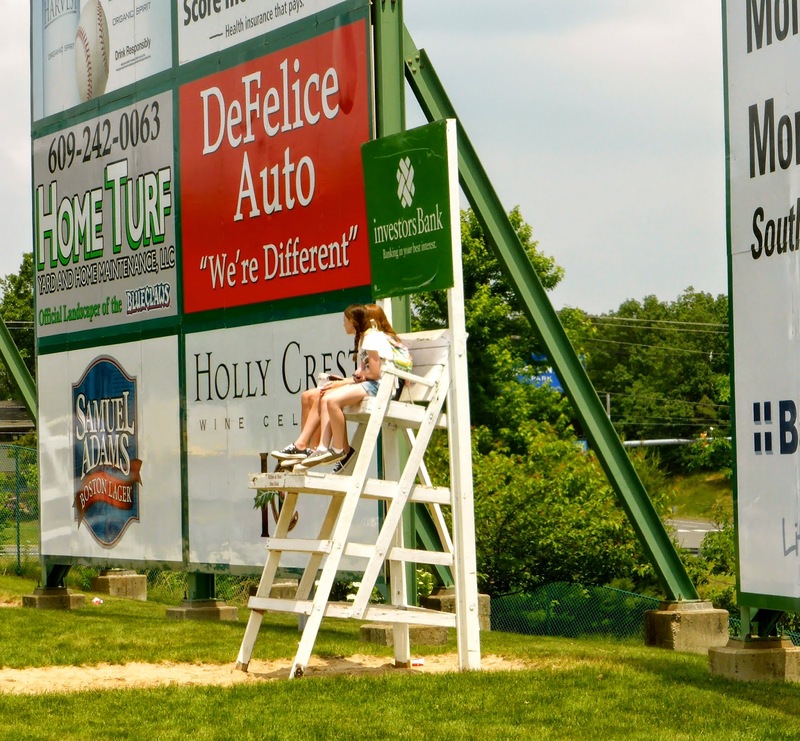 In the minors, pitchers sometimes chart the game from the stands. Sitting a few feet away were Greensboro starters Domingo German and Jarlin Garcia, two Dominicans sporting good stats early in the minor league careers. Worth following them to see if they can make it to Miami in the next few years. Both games took 1:49; in other words, 14 innings in 3:38. To compare, the night before the Oakland vs. Yankees game took 3:33 for 10 innings. I only scored the first game, but there were 204 total pitches, for a PPM of 1.872, a faster pace than every MLB game this season. 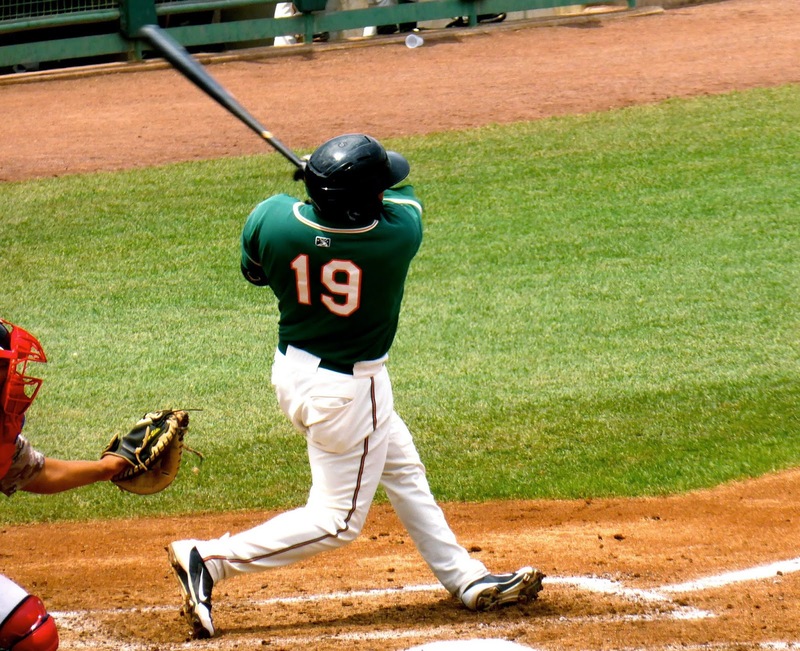 If you really enjoy the game of baseball without all the posturing and time wasting, the minors are the place to go.